As far as I’m concerned, the world could use a few more spiritual memoirs. A lot more people of faith writing about their spiritual journeys. Fortunately, lifelong Quaker Lynn Waddington did just that during the final two years of her life. 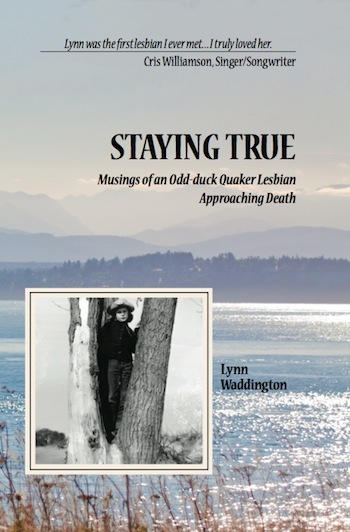 And her partner, Margaret Sorrel, labored through her own grief after Lynn’s death to bring this story to print in Staying True­—Musings of an Odd-duck Quaker Lesbian Approaching Death. The title should be the first clue that this isn’t your average memoir. Bruce Birchard, former General Secretary of Friends General Conference, calls it “a spiritual memoir for the twenty-first century,” and I couldn’t agree more. Lynn took her spirituality seriously (though with a great deal of humor), explored it deeply, and shared it honestly. We are seekers, not finders. For every profound experience I’ve had, I’ve been left with deep questions. I felt the calm seep into me as it usually did. And then I was wrenched open. . . I realized I was trembling and crying. Sweat was running down my sides. I was seen through and through. . . . Every flaw of my being was visible, but the fear that brought was dissolved by the sweetest, most tender love I had ever known. . .This was God—who saw me uniquely and bent down to touch me alone. In Staying True,we have not only an account of the path of Lynn’s spiritual journey through young adulthood, her professional life, her role as a parent, and her relationships, but she also invited us in to her deep seeking near the end of her life. Although she continued to ask questions about what she was meant to do, she also shared the peace she felt from her knowledge of being held in God’s love. Staying True is a source of wisdom, comfort, challenge, and more than a few belly laughs as well as tears. To find out more about Staying True, visit Plain Speech Press.